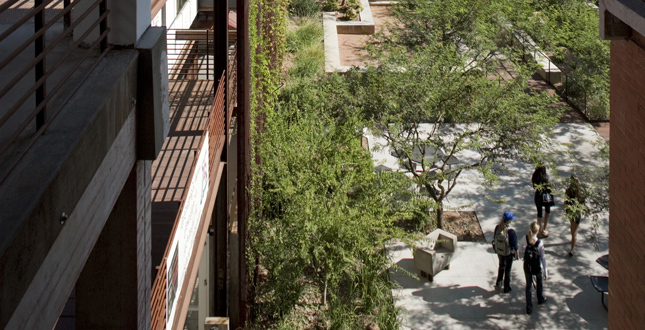 The Sonoran Landscape Laboratory is a high-performance landscape functioning as both an outdoor classroom and entry plaza. 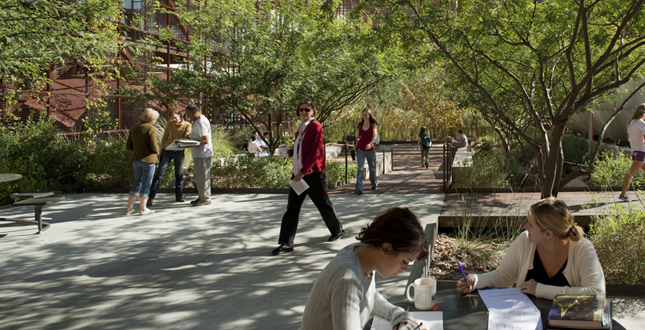 Dappled shade draws students outside, strengthening their connection between program studies and the natural environment. Native Mascagnia macroptera vines cover a southern exposure scrim. Reaching a remarkable 50 feet in height, the vines reduce solar heat gain within the building while blurring the lines between architecture and landscape. 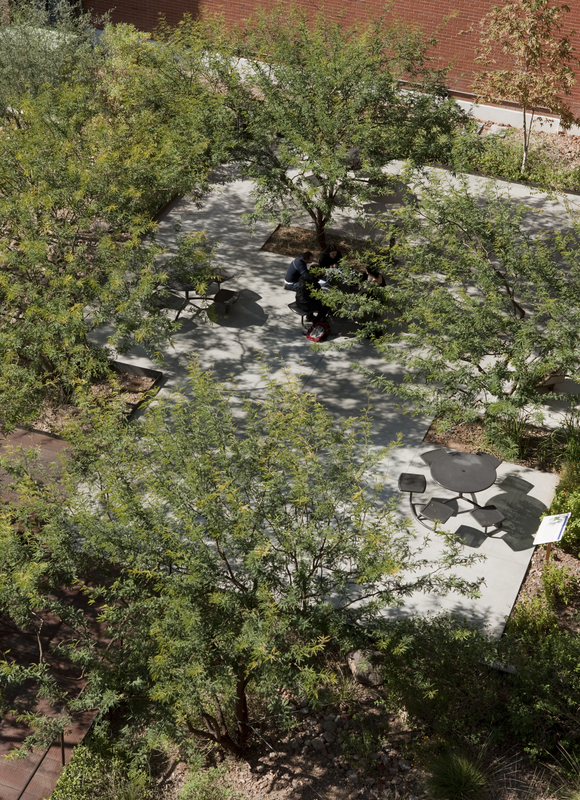 Nestled between water harvesting desert arroyos and beneath a mesquite bosque, a sunken court composed of permeable stabilized decomposed granite serves as both classroom and informal gathering space. The constructed wetland is shown in the background. Variously scaled heights and orientations of cast-in-place concrete seating allow impromptu gatherings and discussions within the lower garden. Perforated steel decking serves as a bridge and ramp allowing water to flow unimpeded through the bioswales, nurturing the native landscape. 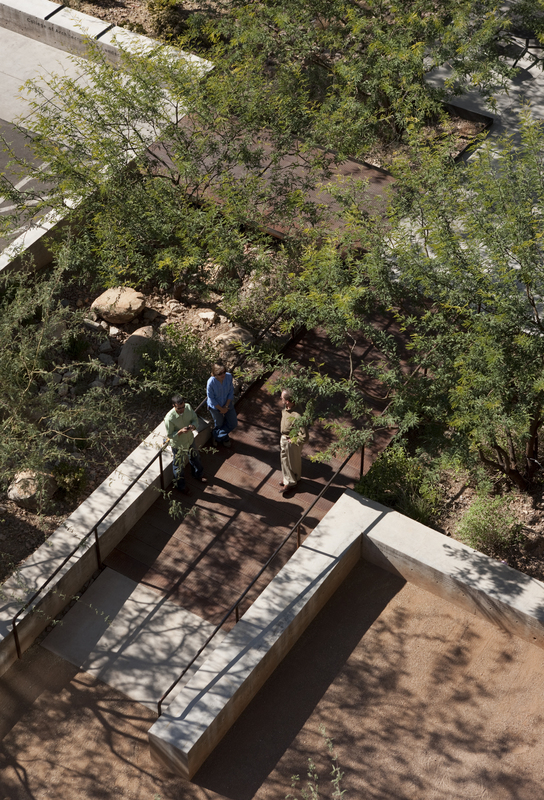 A bioswale planted with native Arizona vegetation envelopes the entry and seating plaza. Prosopis velutina trees provide shade to mitigate the often unforgiving and harsh desert environment. The pond is home for endangered fish and is listed by the U.S. Fish and Wildlife Service as a "Safe Harbor" urban site. Steel runnel recirculating water from the wetland pond. Against all odds within the heart of an urban campus setting, the diverse plant life attracts even the most unexpected visitors. 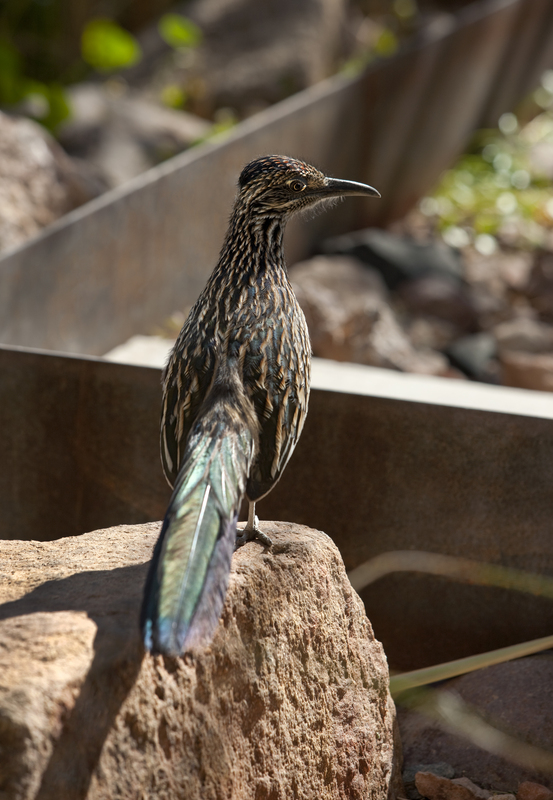 The resident roadrunner, named "Rodney" by the program director, searches for lizards and large insects during his daily visit. 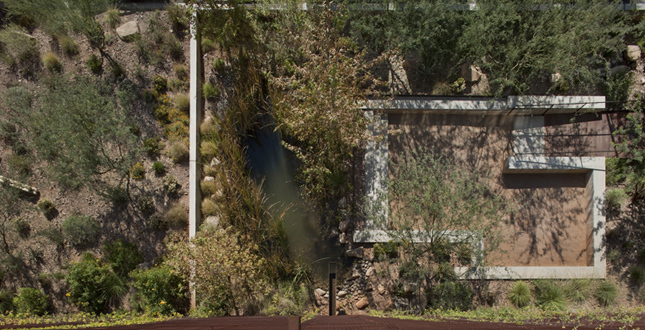 Beyond the wetland and behind the architectural scrim is a glimpse of the storage tank that collects and stores roof stormwater, HVAC condensate and greywater for irrigation use, making the constructed wetland possible in this arid environment. An outdoor stairway connects the old building with the new. 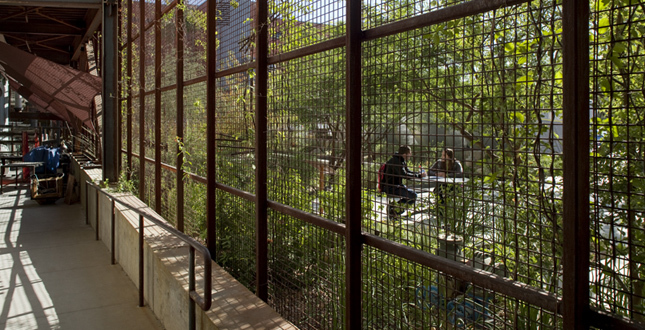 Emulating canyon environments, the tight confines and limited light provide students an opportunity to observe a unique ecosystem not often associated with the Sonoran Desert. 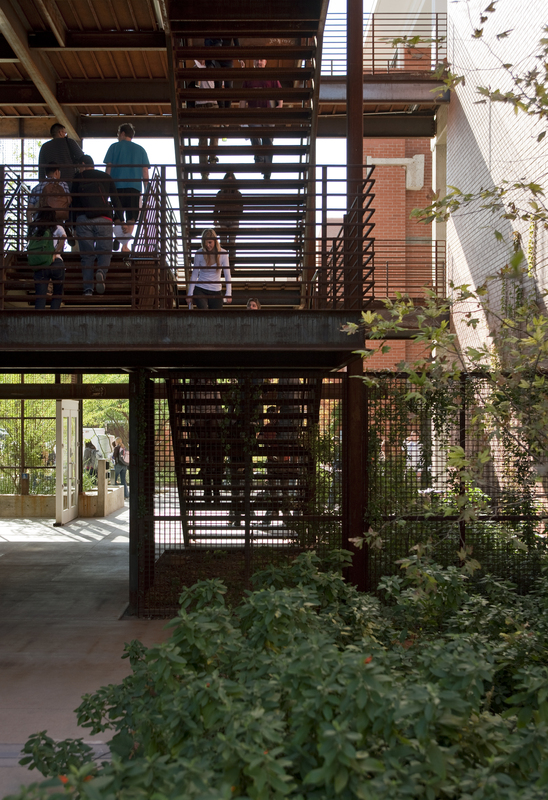 As a working landscape laboratory and classroom, five distinct Arizona biomes are represented within the project limits. These include Arizona Wetland, Canyon, Desert Riparian, Mesquite Bosque, and Upland Sonoran. Four of these biomes are represented here as seen from above. 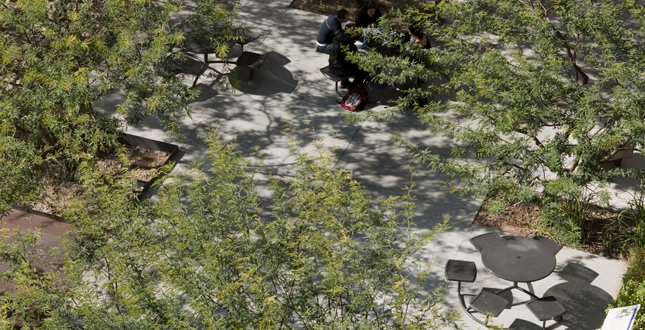 Connecting students from three design disciplines to the natural environment was a goal shared by the project team and the client. Blurring the edges of interior space, views of the garden occur throughout the building, as shown here looking outward from the shop and materials laboratory. 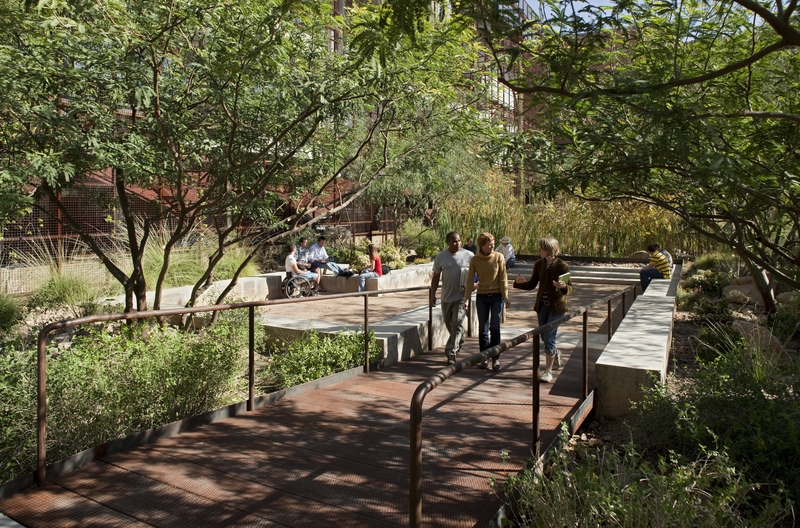 This project is a case in which the gardens and architecture do more than just exist together; they each make it possible for the other to thrive. Made attainable only by passionate collaboration, the Sonoran Laboratory inspires today’s students to carry this spirit into the future. 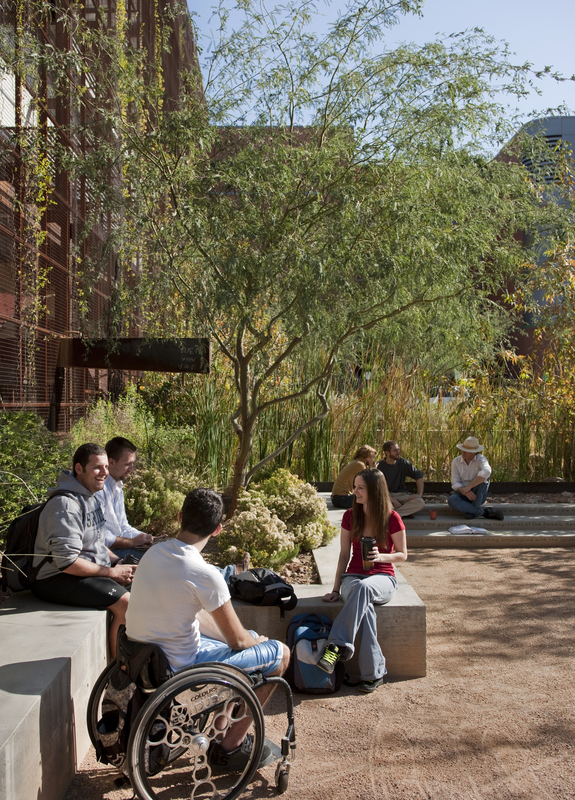 The Sonoran Landscape Laboratory is a high-performance landscape functioning as both an outdoor classroom and entry plaza. It exemplifies sustainable strategies of water harvesting, climate regulation, air and water cleansing, recycling, urban wildlife habitat and human well-being. 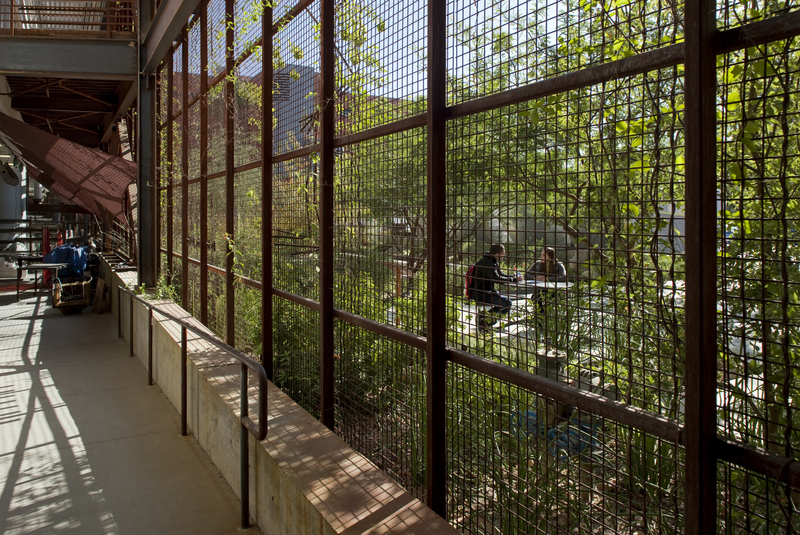 The former greyfield is now a thriving habitat that shades the southern exposure of the new building with a vine-covered scrim. 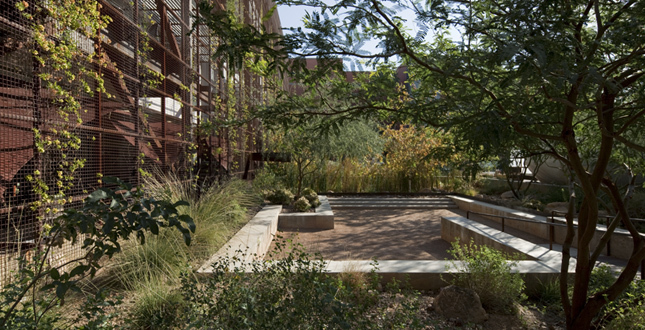 An 11,600-gallon tank collects water produced by the building to support the native garden. 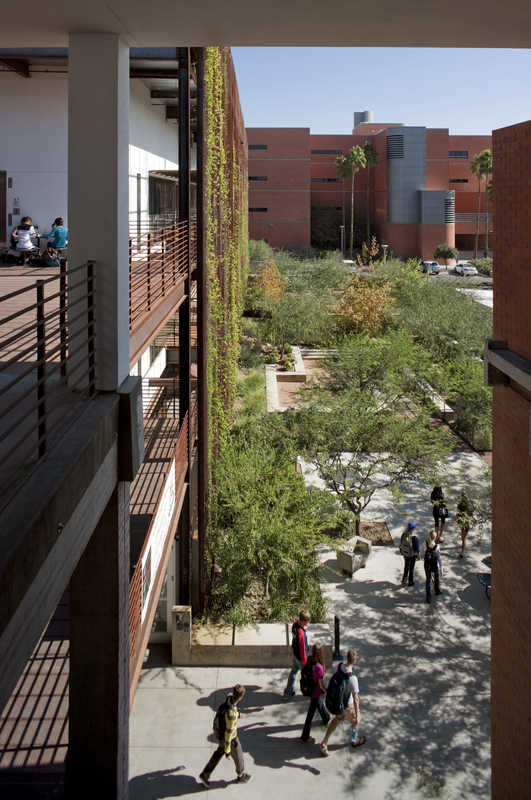 The College of Architecture and Landscape Architecture (CALA) at the University of Arizona built a new expansion facility that allows students from all three design disciplines (architecture, landscape architecture, and planning) the opportunity to work side by side in an integrated studio environment. 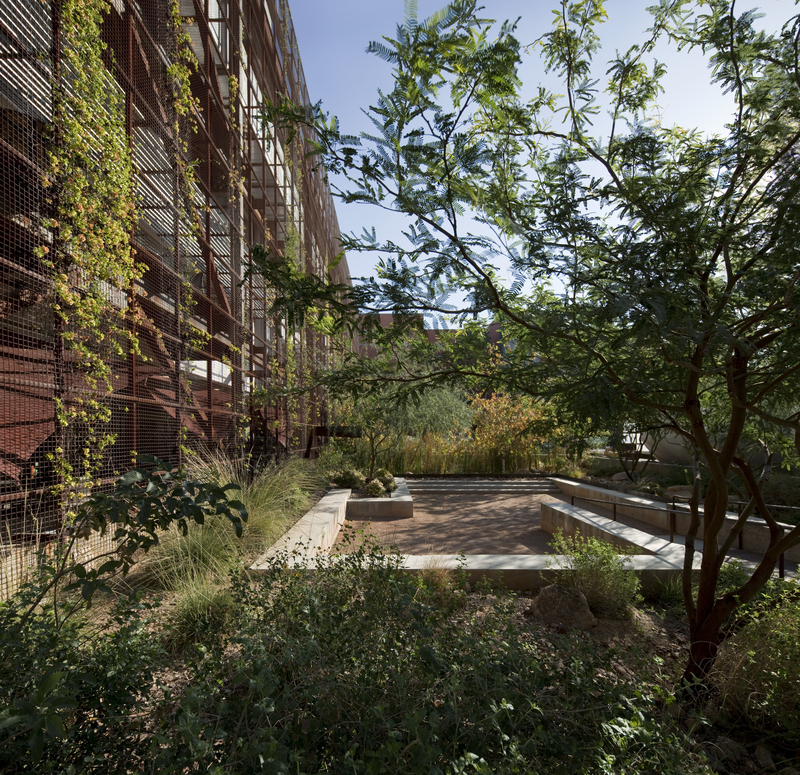 The site also performs as an ongoing laboratory and demonstration facility for sustainable design in the arid southwest. Students from all three disciplines share studio space and academic coursework, and a world-class materials laboratory offers students the ability to research emerging materials and learn design through hands-on building. 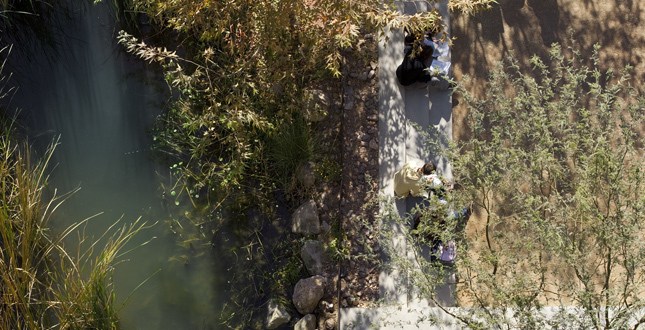 The Sonoran Landscape Laboratory was designed as a low-cost, research-oriented, educational public space focusing on water-conscious design solutions and creating urban wildlife habitat and biomass. From its inception, the development was based on a critical public university/private enterprise collaboration. The faculty requested the site design to be an interpretive learning experience using a range of materials that would be a fun, regional oasis and attraction for existing and future students and professors of the CALA program. The landscape architect was inspired by the fact that the site was part of an existing parking lot and all of the surface water seemed to drain to what would be the new building entry space. The idea of creating a new entry and garden/outdoor classroom that would be a cleansing biosponge garden for adjacent runoff and discarded water from the new building was received positively by the faculty and university. 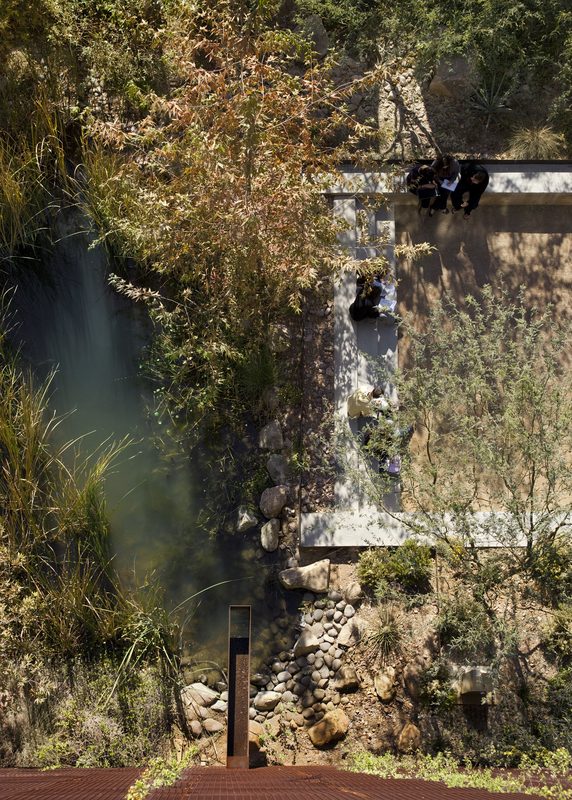 The landscape architect's concept of a floating entry plaza was distilled into a perforated bridge spanning a restored arroyo that conveys reclaimed water to the landscape. 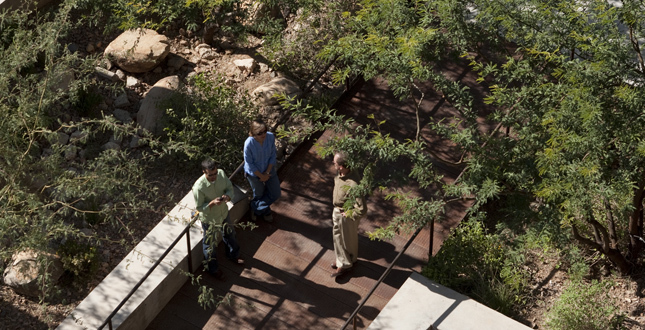 An accessible, sunken outdoor classroom of permeable stabilized granite provides a place for student study, building projects and gathering while detaining water during desert storm events. 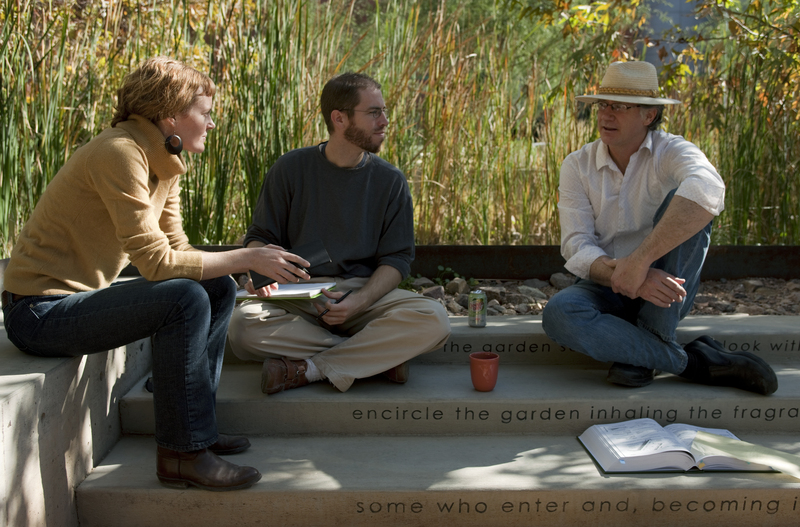 Steps up to the riparian pond are inscribed with a favorite poem of one of the longtime architectural professors that he felt appropriate for the space. 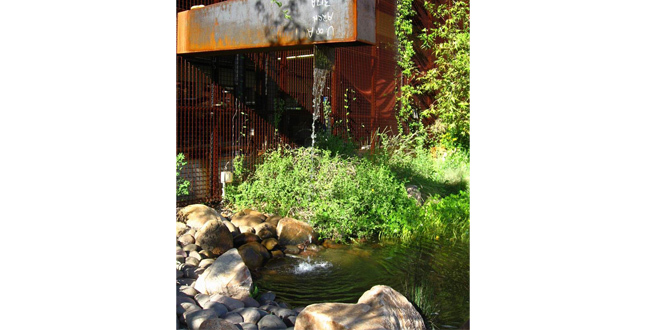 It demonstrates both active and passive water harvesting techniques that dramatically reduces water consumption and exemplifies slowing stormwater runoff to reduce urban flooding. The project increased the biomass of the site 50 percent even with the addition of a new building in an existing urban setting. 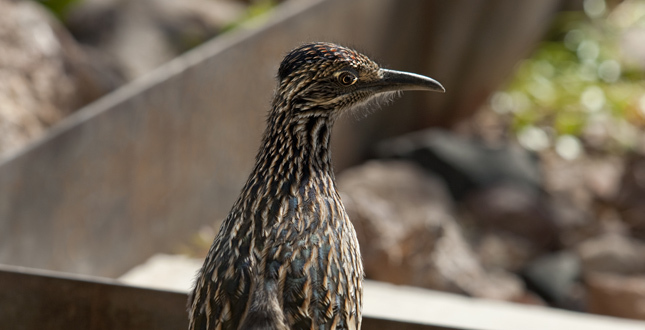 The resulting urban wildlife habitat has attracted many species of birds including hawks searching for ground mammals and reptiles in the garden. 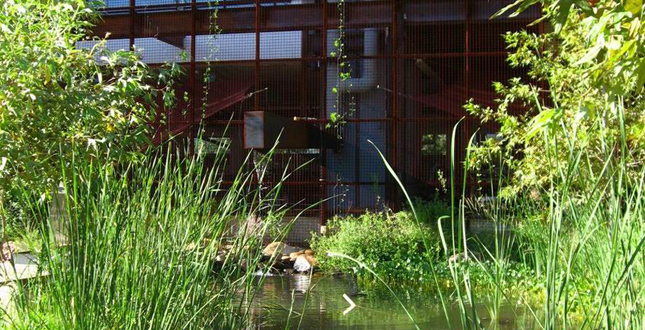 The pond is home for endangered fish and is listed by the US Fish and Wildlife Service as a "Safe Harbor" urban site. The design incorporates on-site recycling of demolition materials. Rubble consisting of bricks and concrete from a portion of the older architecture building demolished early in the project was used within the desert arroyo "microbasins" rather than imported natural stones. 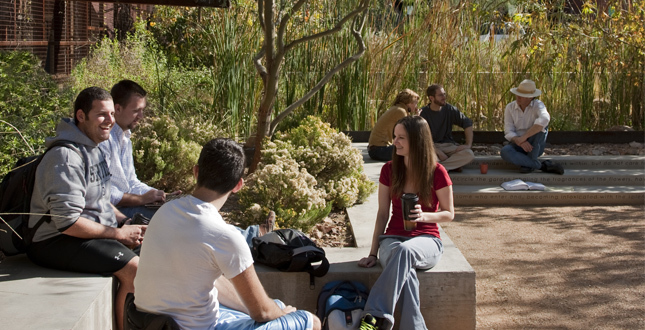 The cooler microclimate created by the garden has increased the opportunities for outdoor gathering and learning in a harsh desert environment and due to its orientation, reduces the urban heat island effect. 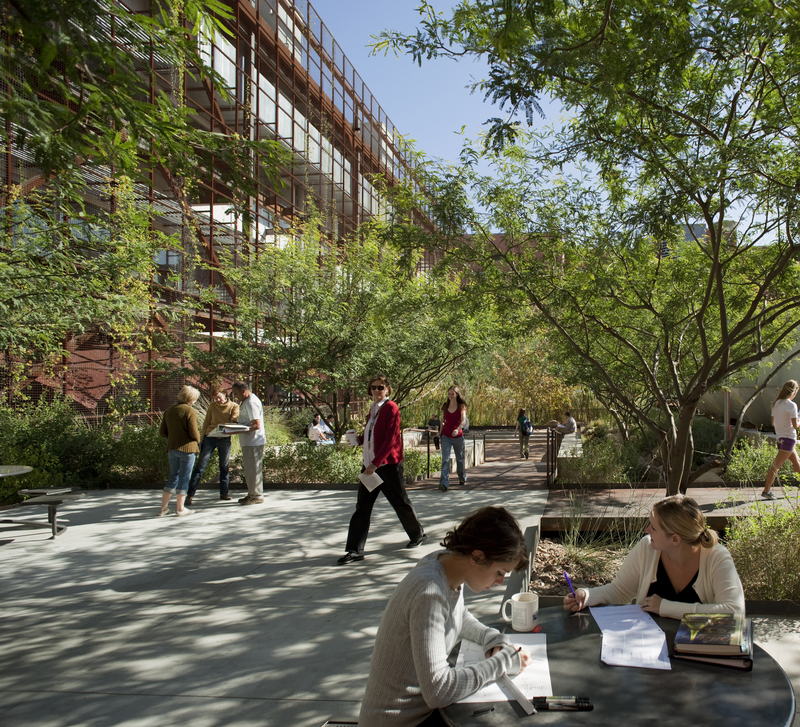 As part of the teaching garden "laboratory," five distinct Arizona biomes are represented within the project limits. These include Arizona Wetland, Canyon, Desert Riparian, Mesquite Bosque, and Upland Sonoran. The vines have climbed to a remarkable 50 feet high up the scrim of the building and have started to shade and cool the building. 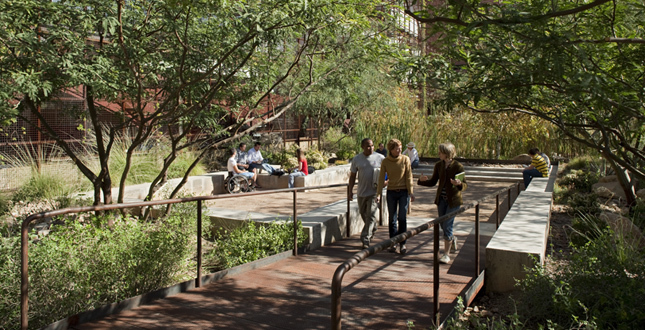 The project is an example to other city/public projects without huge dollar resources that human health and well-being can be achieved through rethinking what urban space is by balancing hardscape and nature and getting the community involved. 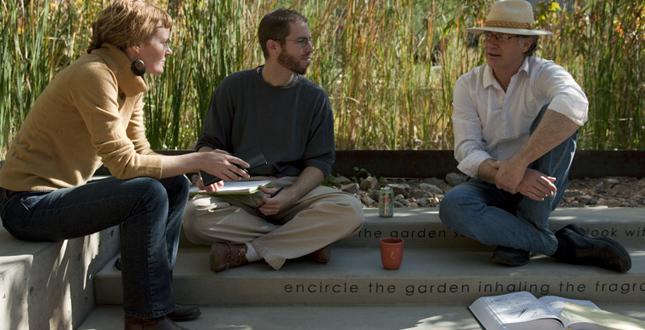 Views from the building to the garden create a restorative, healing environment. Extensive collaboration with the engineers, architect and the irrigation consultant resulted in the design of an extensive building water harvesting system that collects roof runoff, HVAC condensate, and greywater from the building's new drinking fountains. These various water sources are directed to a 7-foot-diameter by 38-foot-tall vertical storage tank with an 11,600-gallon capacity. In the event of limited water supply from these sources, a potable connection to the tank was provided for emergency use. The design also integrated another water source from an adjacent well which required daily flushing for proper operation. This maintenance activity resulted in approximately 200 gallons per day being expelled into a city storm drain system. While directing this water to the fiberglass storage tank proved impossible, the water was successfully diverted into the desert riparian pond which helps maintain its water level and mineralizes the water to produce a proper habitat for desert fish species. Approximately 230,000 gallons of water is harvested annually for reuse. The landscape establishment period (first 3–5 years) requires approximately 280,000 gallons of water annually resulting in an initial potable water reduction of 83 percent per year. A pumping system pressurizes water from the storage tank to be used in the high-efficiency drip irrigation system. A CALSENSE system is used to monitor evapotranspiration rates per biome. Over the next few years, the need for potable water should be eliminated resulting in a completely self-sustaining landscape, rare in such an inhospitable and unique environment such as the desert southwest. 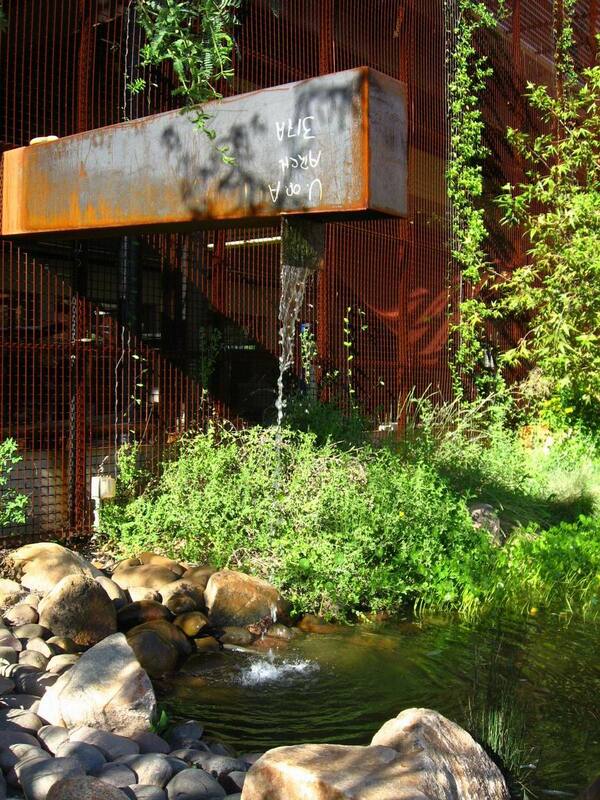 In the event that the storage tank is full and a rain event occurs, the system is designed to overflow into the desert riparian pond and then into the bioswale arroyo. 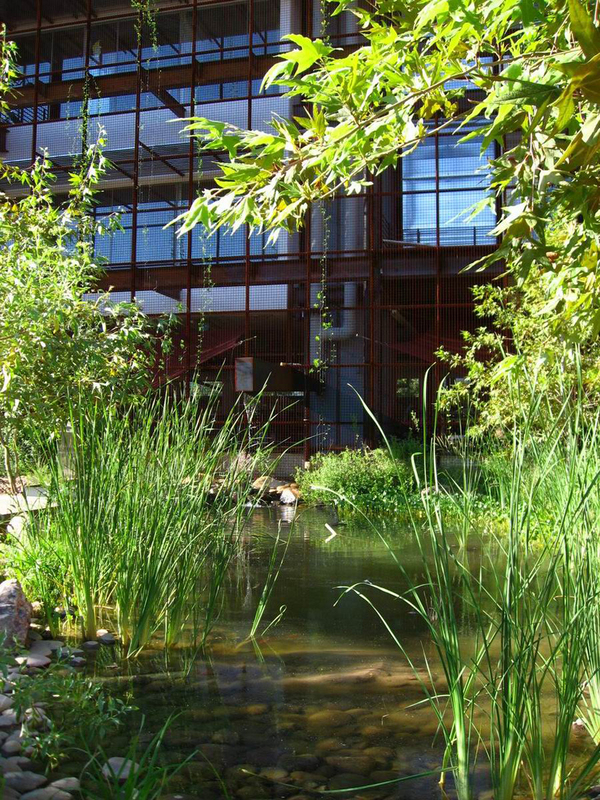 The arroyo is designed to soak up water and let it flow more slowly through a bioswale planted with native Arizona vegetation prior to reaching the low point of the drain inlet into the campus stormwater system. 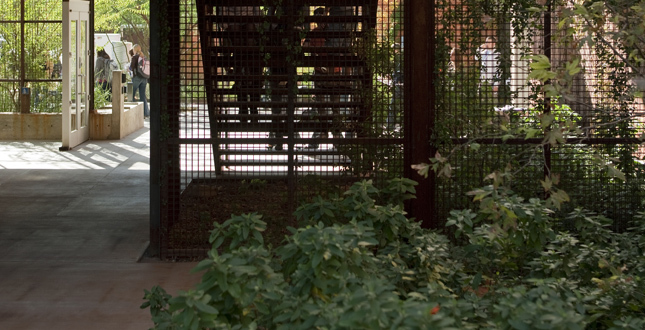 This system helps mitigate the problems associated with rapid urban water runoff, providing critical detention and filtration, while at the same time nurturing a native landscape. We believe this project is a great example to students/future practitioners of partnering with clients and other collaborators to overcome economic hardships in creating new urban places that are high-performance landscapes of daily inspiration for urban dwellers.